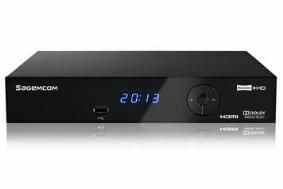 Sagemcom joins the Freeview HD PVR party with new set-top box | What Hi-Fi? Previously the telecommuications branch of Sagem, Sagemcom is now a private, separate entity, and the RTI90-320 T2 HD and the RTI90-500 T2 HD are the company's first two products. The boxes have a fresh design and look on the outside as well as new, advanced 8-day EPG on the inside, and are capable of watching and recording SD and HD Freeiview programmes to the HDD. Twin DVB-T2 tuners make it possible to record two programmes simultaneously while watching a recorded programm. The difference between the two boxes is hard disk drive size, with one offering a 320GB HDD and the other offering a 500GB HDD. The smaller box is set to be on sale at the end of April, while the 500GB will follow in May. An HDMI output, 1080p upscaling, USB and Ethernet ports and Dolby Digital Plus complete the functionality. We're awaiting details on pricing and will bring you reviews just as soon as we get hold of the products.